The Washington Capitals announced today that they signed college unrestricted free agent and local kid Joe Snively to a two year contract that starts next season. Snively is a small, like very small, left winger. He clocks in at 5’9″ and 180 pounds, but what he lacks in size he makes up for skill and smarts. He’s reported to have a great shot and vision, high hockey IQ, and a feisty ability to win puck battles. His skills were prevalent in his college career when he scored 139 points (58 goals) in 129 games. Leading his team in points for all four years is quite rare. Usually freshman are in the depth of the lineup, playing little minutes, but Snivley instantly made himself relevant and the production followed. What’s interesting about Snively’s college career is after his freshman year, the next three resulted in pretty similar point totals. Usually a player starts small and builds his way up to bigger numbers, having his senior season being his most productive. But as shown above, he scored the same amount of points in his senior year as his sophomore year. So is that a bad sign? At a deeper look it’s easy to see how this happened. In his freshman year, Joe lead his teammates by two points. In his sophomore year it was by four points. But for his junior year he led his team by an astounding 16 points, which includes nine more goals than the next player. And for his senior finale, he had a ridiculous 18 more points, including 10 more goals, than his next teammate who had a total of 18 points alone. Snively wasn’t the reason why he didn’t keep adding to his point totals over the years, it was his team. Snively was carrying them and still put up great point totals. He either scored or assisted on 42% of their goals this past season. 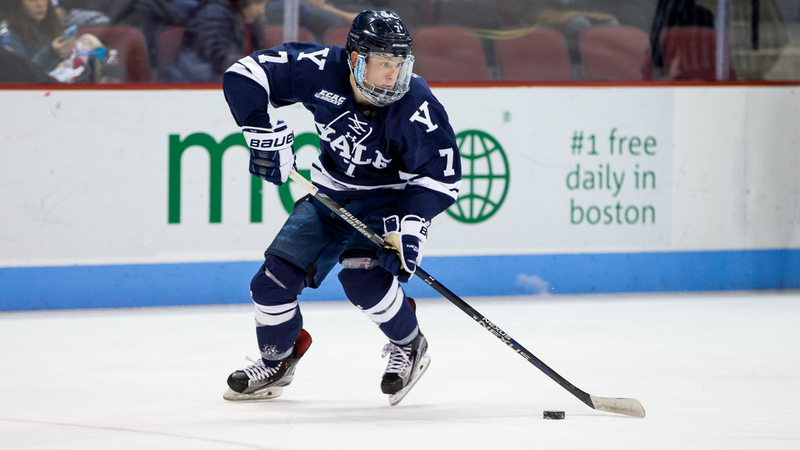 So nearly half the time Yale scored a goal Snively had something to do with it. Imagine if he had some help, how many points would he have reached then? 50 points probably wouldn’t be out the question. And just for added context, over the four years with Yale, he scored or assisted on 39% of all of their goals. That’s very impressive for a winger. But don’t get too excited. What’s really important to know when signing undrafted free agents out of college is that they rarely turn into anything. About 95% of them never do anything in the NHL. The Capitals got lucky when they signed one of the best ones in the last decade with Nate Schmidt, who turned into a great top three defensemen in the NHL. But for context, Zach Aston-Reese signed with the Pittsburgh Penguins a couple years ago after his amazing 63 points in 38 games in senior year, and he still goes in between the NHL and AHL. He has 23 points in 59 NHL regular season games, which is good but it’s not top six production or anything special. But there’s also nothing wrong with finding free third line talent. So don’t expect Snively to come in and tear it up and turn into a NHL scoring pivot. It could happen but the chances are low. At the very least it shows the Capitals are going after players with a high ceiling, which is exactly what they should be doing as they head into the upcoming draft. And at the very very least, the Hershey Bears should be able to use Snively’s speed and skill in their lineup over the next couple years. As Snively said though, if he wants to make it to the NHL, then he has more work to do. He has the skill set to do it, but what’s next is up to him. This entry was posted in News and tagged Joe Snively, Luke Adomanis. Bookmark the permalink.